Waxing, shaving, poking, prodding . . . there is only one other body that I can think of that probably needs more maintenance than Hannah’s — and that body belong’s to Rachel, my unicorn. Today Rachel went to a dermatologist and he gave her a cortisone shot in her unicorn horn. Yes, it is true. I think I have created a monster. A while back I told Rachel about zocdoc.com. She has MagnaCare, an insurance none of her regular doctors accept. I stumbled upon this website where you pick your specialist, your insurance, your location, and then once you pick a doctor you can make the appointment online. It works for Rachel. I met Hannah at the train station at around 1 pm. I packed a lunch for her — ginger peanut soup and ice water. I nourish her body and then drive her to the doctor. On the way there she reached over the seat and screamed out. Paper cut. Blood everywhere and no band-aid. Short wait at the gynecologist’s office. Hannah came out with a boring tan band-aid on her finger for the paper cut. Booooring! Don’t know what went on in there. I wasn’t invited. Let the fun begin. At the pediatrician’s office Hannah is given a cup to pee in. She claimed she was all cleaned out. “Sorry, but I gave at the gynecologist’s office.” Okay, so they took blood instead and plenty of it. 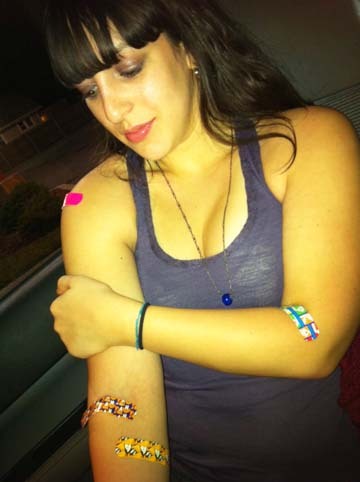 Notice all the pretty band-aids Hannah is modelling. Lovely. Now let’s see, there is a band-aid for meningitis shot, a TB test, and 2 blood tests. Hannah was ecstatic when she heard that she was not the oldest patient at the pediatrician’s office. Try 30 years old. Wine is making me tired. Good night. Find your seat, sit back, and enjoy the show. Yes, I said sit down. My ticket has a seat number on it and I am so looking forward to resting my tush. I’ve given up going to concerts where I know I have to stand — actually that’s not true –I usually give in at the last-minute when Drew says, “you don’t have to go, I’ll go with out you.” Although lately I think he’s on the same page as I am. After dinner and many texts later, we found the girls huddled in a corner a few blocks away. We stopped at Starbucks before the concert. My feet were already hurting. I love my Doc Martens but they are not walking shoes. I was looking forward to sitting down. At Radio City I found my seat, sat down, and I was ready for the show. As soon as Bright Eyes walks on stage the entire audience starts clapping and screaming and they ALL stand up. Everyone is crazy excited. I take a deep breath. They’ll stand for a song, and then calm down, and sit. But that is not what happened. No one sat down for the entire show. What’s with this? I didn’t want to appear to be a weenie-concert-goer so I stood. Drew and I were sitting next to Josh and his friend and I didn’t want him to look over at me and think, “wow, maybe she’s too old to be here.” I didn’t want to embarrass Rachel. Meanwhile Hannah and her sister, Rachel, were up close and leaning on the stage the entire time. They probably got to actually see Conor Oberst on stage. What’s with the lighting? Bad hair day? Pimple? Sty? Did he not want anyone to see him. Either it was dark and I couldn’t quite see where he was or the lights were crazy blinking in my face and I couldn’t see anything. I made it thru the concert. I did sneak a sit. And then, instead of hopping in a cab, we walked over to the E train — which, we found out too late, wasn’t running at night — missed the 12:35 am train, and ended up sitting in Penn station for an hour. I was in bed by 3:00 am and asleep by 3:01. I’ll say this: Sitting or standing you can’t escape the glow. Maybe that’s why the show is so blinding, and glitzy — to distract the band from all the screen glow from phones, blackberrys, droids, and whatever else battery operated device that fits in a pocket.